It’s hard enough for us to cope, imagine explaining the loss of a pet to children. Sadly it’s one of those things in life that are inevitable. Of course it’s to be dreaded, but if handled properly, it will serve as an important lesson in loss, love, life and compassion. Do your pets greet the kids at the door when they come home? Do they serve as a confidant, the first one your child talks to? Are they best friends, a support to help them feel less alone in the world? It is a bond that people who don’t have the pleasure of sharing their lives with animals, can never possibly understand. Yet it is an important one. It’s a natural instinct to want to shelter your kids from the bad in the world, but you won’t be doing them any favours in this case. Please do not lie and say the dog/cat/rabbit… ran away, or got lost. First of all it’s the wrong thing to do, and why would you allow your child to worry, wondering if he’s okay, and hope he’ll find his way home one day? If your pet is old, or has an illness that he won’t recover from, you will be able to explain what’s going on, over time. They will see the animal isn’t well, be aware of your trips to the vet, medication etc… so will have time to understand and absorb. 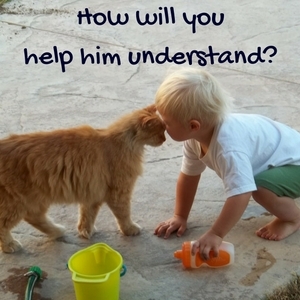 It is an opportunity to teach your child proper care of animals, and compassion for others. Explain the importance of preventing suffering, that everything possible has been done to help, and when the time comes the vet will give him a quick injection that won’t hurt, the pet will not be scared or in pain, and he will die peacefully. Be careful of the words you use. It’s okay to say things like “died” “death” so they understand what that means, but using words like “put to sleep” or “going to sleep” are not a good idea. They associate those words with bedtime, and can scare and confuse them. Call it what it is. You know your children, and their age and ability to cope will determine how the detail you go into, and the words you use to explain what’s going on. Answer their questions, don’t ignore them. What if your pet dies suddenly? If something drastic happened, and you had no time to prepare yourself, never mind the kids, briefly and calmly explain what happened. Let their questions guide the conversation. I don’t know whether or not you’ve ever broached the subject of death with your kids, but that’s a tough one for any of us to answer. You could talk about your own belief or understanding of death, what your faith says about it, or give an honest “I don’t know” because none of us know for sure. We all feel a range of emotions when experiencing loss, and they will as well. Loneliness because their friend is gone, anger, guilt because they didn’t always take care of their pet like they said they would. Encourage your children to express their feelings, and share yours as well. It helps to know you’re feeling the same. If they don’t want to talk right now that’s okay, but don’t let them keep their feelings bottled up for long, and be sure they know when they’re ready you’ll be there to listen. You’re keeping the lines of communication open, and encouraging your kids to share their feelings. What else can you do to help? Your children may want to have a funeral. It’s a chance for them to say goodbye and do something special. There are pet cemeteries if you prefer, or a backyard burial means they’re still close. If your pet will be cremated, perhaps they’d like to help you pick the urn. How about a scrapbook full of pictures, funny stories… Go shopping with your kids to pick out a special book, coloured paper, stickers, markers… Even if they already have everything at home, they may want things they pick out specifically for this occasion. Other ideas include planting a tree or bush, buying a paving stone with your pet’s name on it, a picture frame with the pet’s name and picture, or buying some supplies for the local shelter. Explain how this will be helping lots of other animals that are waiting for a home feel so much better. You may be ready to adopt another pet rather quickly, but hold off for a bit. Your kids may not be ready for such a big step, and they may get angry, feeling theirs wasn’t important and so easily replaced. Hopefully you will be able to give another animal a home, when everyone is ready. The priority is helping your kids understand what has happened, grieve, accept, and be happy with the memories. Not an easy conversation to have with grownups, never mind kids, but necessary nonetheless. Be honest about what happened, let their questions guide you, help them understand what a kind and compassionate thing you all did, and how it’s okay to be sad because they were lucky enough to love someone so much. 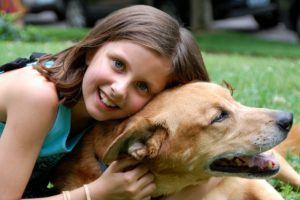 Explaining the loss of a pet to children isn’t easy, but see it as an opportunity to teach them about loss, love, compassion and the joy that comes with sharing their lives with animals. Hi Hindy, I’ve never actually had a pet since I’ve been older, however after a lot of thought I would think it to be actually quite hard to explain to my kids that their pet has died. This is not something I want to do, but I’ve always been interested in getting a dog for them. After your article, I sort of know how I would be able to tell them once the pet does pass away. Hi Brandon, definitely not a pleasant thing to have to do, but it is a good opportunity to teach them about kindness and compassion towards other living beings. I’m glad you enjoyed the post. Man that is never a pleasant situation. I have been around animals all my life and have lost a few of them. It’s never easy. It’s a part of life. And my son has gone through it as well. Thus article helps. Hi Brent, it’s bad enough when we have to face it, but trying to help kids understand is a whole other situation. Sadly it is a part of life, and not something we can hide from. I do hope this article will help when others are faced with having to have this very sad conversation with their children. 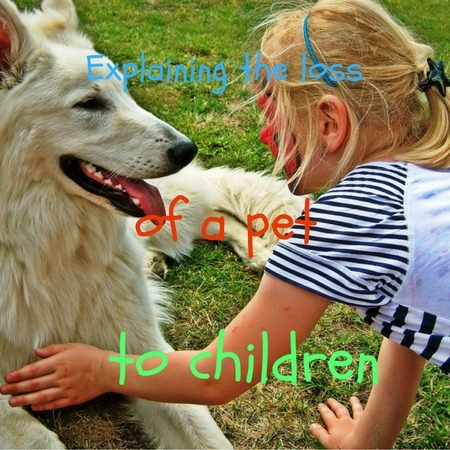 Hi Hindy, these are some useful tips on how to explain the loss of a pet to your child. We lost a pet (way too young unfortunately) two years ago when my son was only 2 years old. At that time we decided to just tell him that Ruby went to heaven as he gets a little older we will explain the concept of death to him. Thanks! Thanks Jeremy. Sounds like you did the best thing, and told him what he was better able to accept. It’s such a complex issue, adults don’t even understand it, so how can we expect kids to. I used to have a cat that bond closely with me when I was like 5 yrs old. I still remember clearly how it snapped at me 3 days before it died. It has never done that before. I think even as child, we need closure in terms of our pets. I agree with you that getting straight to the point is the best way. Hi Kenny, sounds like your cat probably wasn’t feeling very well doesn’t it! Although we’d like to spare children from pain, lying about what happened to their pet won’t do them any favours. It’s important to tell them the truth, but only in a way and to the degree they can handle, and parents should be the best judge of what their child can handle. If they aren’t sure, seeking advice from a professional is a good option. What a hard thing to handle as a parent and one that definitely needs to be handled correctly. This is a very helpful article for those who do have to deal with it. Good tips here. I lost a pet as a child and took it quite hard. It was my first real experience with death. Hi Carleen, I can imagine how difficult it must have been. I didn’t grow up with pets, so my first experience with pet loss wasn’t until well into adulthood, and man was that hell. These are some great tips. This is something I think about every now and then and know when the time comes it’s going to be so difficult no matter how prepared we are. Thanks for sharing! I’m glad you found the tips helpful. It will definitely be tough no matter how prepared, but having ideas of how to approach it will definitely help. I know what you mean Nichole. They have good intentions by thinking they’re protecting their kids, without realising they’re doing more harm than good. Hopefully they’ll see this post and think twice when faced with this situation. Wonderful post. My ten year old daughter has unfortunately already experienced the loss of several pets. Our 14 year old Yorkie who passed of heart disease in 2013 and most recently our cat who passed on Labor Day of this year. We have always been honest with her and encouraged her to ask questions and feel what she feels. When our cat passed a few weeks ago, we bought a flowering plant in her honor. Our daughter also still writes stories and draws pictures of our Yorkie Pip. Thank you. I’m sorry your daughter has experienced so much loss at a young age, but it’s amazing how open and honest you are with her. She must be such a kind and compassionate soul, thanks to you. These are great tips for children. We also wrote a post about creative ways for children to grieve – poems, drawings etc – it’s important that kid’s express their feelings and deal with grief they best way they can and with support from adults. Thank you and couldn’t agree more about the importance of expressing grief in a healthy manner. Hi Ruth, sounds really beautiful the way you handled things. We’re all so petrified of the word death, I can’t help but wonder if you’ve helped lesson the fear of it. With my daughter off at college and only home for holidays and summers, I often wonder how I would handle the conversation should something happen to one of the dogs. Zora, a yellow lab, who is almost 14, came into our family when my daughter was just seven years old and she is definitely starting to slow down and show signs of aging. 14 is a good long life for a lab and while Zora is doing reasonably well, I know it is likely that she could die before my daughter finishes her college career. If something were to happen while Maya was at school, I worry that telling her could derail her studies but I know that is something I couldn’t keep from her. While I know that your post is geared more for younger children, you have got me thinking about the best way to prepare for the inevitable conversation. Thank you. I didn’t grow up with animals, but I know how crushing it is when they leave. When I lost my first cat I cried for 3 days and couldn’t go to work, and I was quite a bit older than college age. I can’t imagine what it must be like for someone who spent most of their life with their dogs. It’s devastating to all of us, but given you’ve already started to think about how to handle it, your daughter is in good hands. A lovely post and really helpful guidelines for anyone with children and who is stuck for the best way forward. It’s hard enough for us, isn’t it? Thank you for adding cats to your post too, it is much appreciated by us. Thank you. It’s devastating for adults, and we’re in a position to intellectually understand what happened, yet we still fall apart. I had cats long before I had dogs, so my first experiences with pet loss were the cats I shared my life with. I hope this post helps no matter what type of pets kids have. Hi Hindy: This is a really beautiful post and I haven’t seen many folks write about this topic. My sister has an old Lab and I will flag this for her when the time comes as I’ll be so emotional myself it’s nice to have this resource for her two kids. They’ve only known Polly…. their whole little lives. I’m so sad just thinking about it. Thank you Christine. 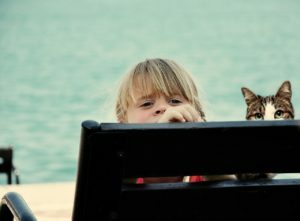 It’s such a sad topic, I cry when I write it, but… I didn’t grow up with pets (a loss for me I would say), so I can’t imagine what it must be like for kids to be fortunate enough to know that kind of connection with an animal. Such a touching post. I had a very difficult time with my dog’s death when I was about 16. It was a tough time in my life and the situation around my dog’s death was very difficult. It’s something that sticks with you. I love your ideas. Thanks for sharing them. Thank you Tonya. I’m very sorry to hear that, and yes it sticks with you. In my experience, as horrific as the passing of my animals has been, something sudden or that shouldn’t have happened was the hardest of all to deal with, and I still have a hard time if I allow myself to think about it. Very good advice! I love the scrapbook & tree planting ideas. You never know how kids will react or what questions they’ll come out with that may surprise you. I was talking w/ a group of kids once about therapy dogs & Pet care. Somebody brought up the death of a pet & I shared that my childhood dog was buried in my mom’s yard. Well! This one kid was so shocked by that, it seemed to really upset him. You have to be careful with such conversations & be prepared for any reaction. Thanks for sharing that Cathy. It’s not only kids that can be shocked by that! I know someone who always buries their pets in their backyard. Although mine were cremated so I kept them with me, I decided we should bury one of my cats who was very sick with untreatable cancer. We had just bought a house, and I thought how wonderful to bury him under the dining room window. When the time came, my husband spent hours digging (it was all rock) and we buried him. I was so horrified by what I had done, and the thought that he was in the ground with the worms… I couldn’t bear it. I made my husband dig him up that night and I took him to be cremated. I’m an adult and look how I reacted!! Oh your poor husband, having to dig him up. You never know how people will react to death. He was very not happy with me, but with all the crying I was doing he had no choice. When I told other people the story, their first reaction was they couldn’t believe I would want to bury him in the first place. This is such an important topic and I’m so glad you wrote about it. When I was a child, my mother had our dog euthanized while my brothers and I were away at school. I came home from school and looked everywhere for our dog without finding him. Looking back, my mother didn’t actually need to euthanize our dog. She’d mistakenly assumed he was aggressive when the real story was our dog bit my brother because my brother pulled his tail. This incident has affected me throughout my life. It caused me to have a 13+ year career working in veterinary hospitals so I could help educate people about pet care. Absolutely, children should be kept informed and have the opportunity to say goodbye. While my case was different, since I don’t believe our dog needed to be euthanized, I still can say first-hand how it felt to find out our dog was suddenly gone without any warning. Thanks so much for writing about this and bringing up the fact that children are better off being kept in the loop in an age-appropriate manner. Thanks for sharing your experiences, and unfortunately you have seen, first hand, what happens when no one explains what happened, or what is going to happen. I’m sad to hear how it has stayed with you, but what a wonderful career choice as a result. I’m sure you have helped many people take better care of their pets, because from what I see…they need all the help they can get. This subject is a very important one for children. The first time I lost a pet I was 5 years old and it was a sudden loss. I had very innocently been playing with my pet parakeet in an inappropriate way (I didn’t know it was inappropriate at the time) that resulted in the bird’s death. Death stings. It really hurts – it can hurt for a long time. However, it can teach us to be more compassionate and to have a very high value for life. My bird’s death taught me that sometimes even when we are sorry, we can’t undo what we’ve done. We have to be very careful and think about how our actions will affect others. I can’t imagine how difficult that must have been, and you’re right. Sometimes we have to learn very tough lessons about the affect our actions have, and there’s no greater lesson than compassion for others. I imagine your experience has helped many others learn about consequences, something too many in today’s society don’t have to face. I haven’t had to deal with this yet as I don’t have kids so… And I think my friends would want to explain the issue to their kids themselves. Most definitely. This is merely a guide for parents, should they have a hard time figuring out how to handle telling their kids. That sounds sad to me, depriving the family of the love of a pet because of that. Of course I’ve met many people who can’t handle the thought of saying goodbye again, and won’t have another animal because of it. It’s true it’s horrific, I guess I can’t imagine my life without one, as much as I’m heartbroken every time they leave. These are wonderful suggestions! 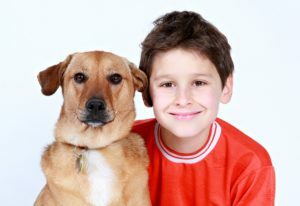 It is very hard to lose a pet at any age, but kids are especially vulnerable to feeling guilty and blaming themselves, even if they had nothing to do with the death. Thank you Beth. I can’t imagine how hard it is for them, but I know what I nightmare it is for us. Hopefully parents will get some tips that will help them help their kids to cope. Thank you for this article. I recently went through the loss of a pet, and it was terrible. I can’t imagine how hard it would be as a child or as a parent having to explain it to a child. It most certainly is terrible, no matter what age you’re experiencing it. As someone who has loved and lost a pet…my heart breaks and this is such a very important topic. To this day, I cannot even fathom it sometimes. I am glad you put this topic into a post – the more who know the better. I feel so bad for the kids and all affected by pet loss. Hi Carol, thank you for your comment. No matter how much time has passed, you never forget that “moment” do you? It is a difficult topic for me to write about, but it’s something all of us who have the pleasure of sharing our lives with pets, will experience. The more we talk about it, and discover resources to help, the better able we will be to cope. That’s my wish anyway. Such a hard topic, but thanks so much for the helpful tips. Thanks Jenna. It is a hard topic, no matter what age. I’m glad you found the tips helpful.